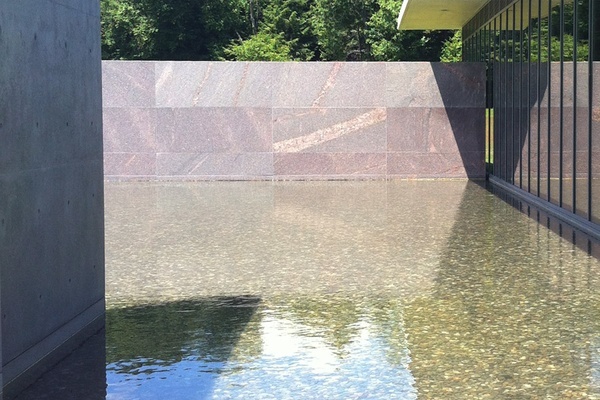 The new Clark Center and reflecting pool. Photos by Becky Cheang. 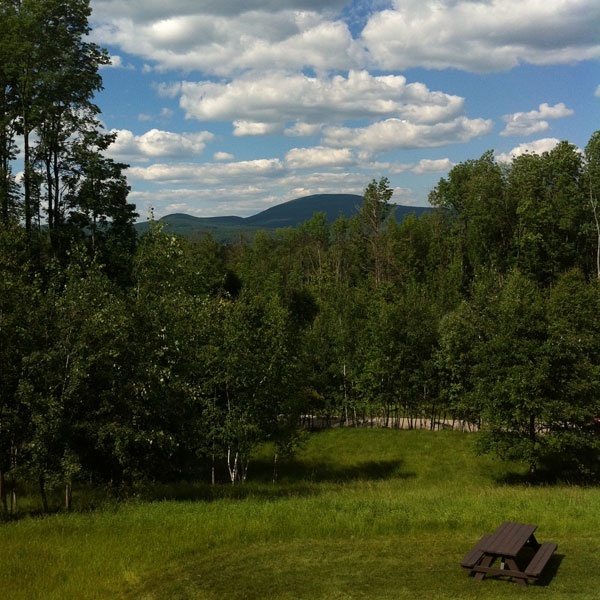 Popupla assistant Becky Cheang took a day trip from New York City to check out the recently renovated in the Berkshires. She found her perfect summer activity and is already planning her perfect winter return trip. WILLIAMSTOWN, Massachusetts – Some people suffer from jet lag. I suffer from sudden and extreme changes in air quality. Barely a week after my return from a trip to the English countryside, New York City's vapors were getting me down. 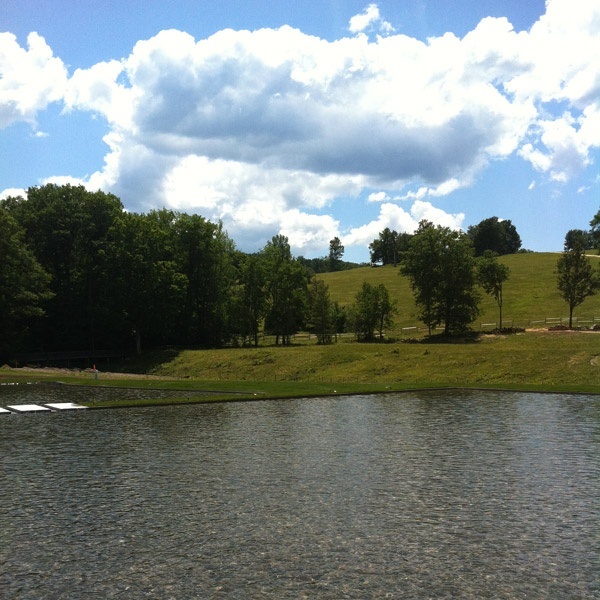 I needed to escape the city and was only too happy to go to the Berkshires for a media preview of the newly renovated . Robert Sterling and Francine Clark opened their small museum in Williamstown in 1955 to house their impressive collection of European and American art. There may only have been two galleries in the beginning, but the Clarks had vision, both artistically and architecturally, and the Institute has kept up the tradition ever since. In 1973, The Clark added the Manton Research Center. And for the past fourteen years, it has been undergoing a massive renovation. 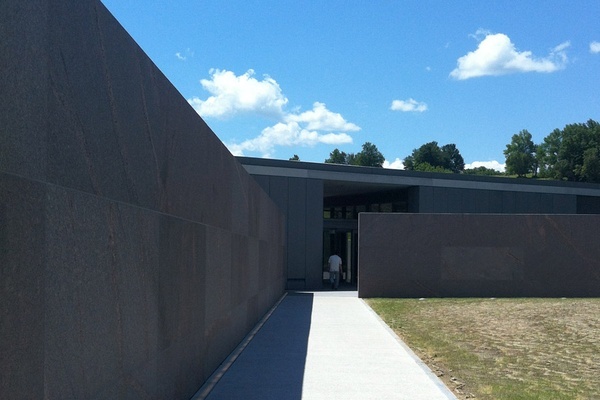 In 2008, part one was finished: the Lunder Center at Stone Hill, designed by Japanese starchitect Tadao Ando. I was here for the big reveal of Ando's second structure, the 42,600-square-foot Clark Center, which includes a new visitors' center and exhibition spaces, and Reed Hilderbrand's redesign of the 140-acre landscape. I love architecture and art history, so I have high expectations of the day. After a three-hour bus ride from New York City, the first thing I see is a long and tall concrete wall leading the way from the parking lot to Clark Center. This is no accident. Ando designed the space so the initial view is primarily confined to long walls of concrete and granite. 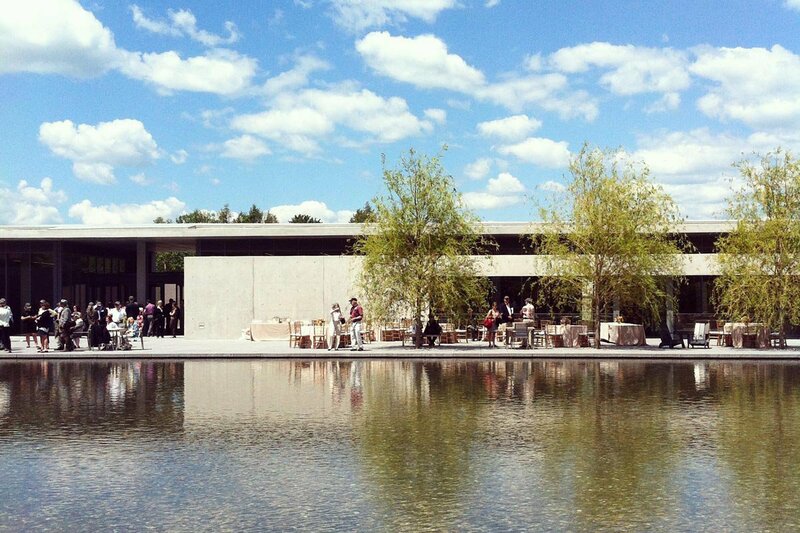 I walk through the glass doors into the visitors' center and find myself on an outdoor patio by a one-acre, three-tiered reflecting pool. A slice of the one-acre reflecting pool and 140-acre campus. 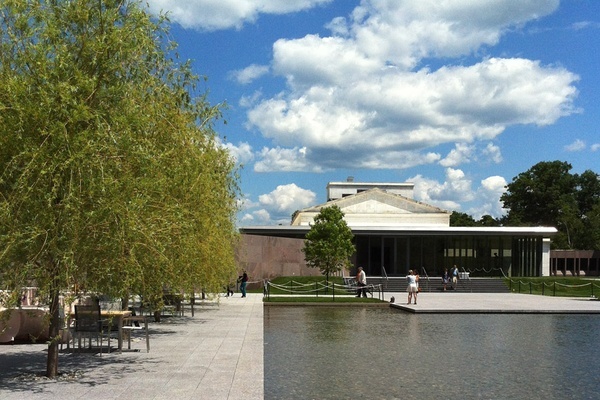 The reflecting pool, with its 2,000 gallons of collected storm water, irrigates the surrounding land. Come winter, the pool will be turned into an ice-skating rink. I might have to brave the New England cold for this. Ando makes concrete, metal, and a normally harsh palette of greys feel soft, open, and remarkably breathable. I feel rested everywhere throughout the campus. I stand at the edge of the pool, gazing onto the idyllic setting, emptying my mind, breathing the fresh New England air. This place is better than a yoga retreat. I know I'm just getting used to it, but I already can't wait to come back. What I love best is that these grounds — as well as the patio, the reflecting pool, the surrounding trails and paths — are free to the public. As is the ridiculously extensive art library. Visitors can come from dawn to dusk, regardless of museum hours. Admission to the galleries costs $20. Museum shop with Japanese designs. Staircase to the lower level at Clark Center. Outdoor patio at Clark Center and new entrance to the original museum building. The current Chinese ritual relic bronzes exhibition, , on loan from the Shanghai Museum, is fun and educational. It's on view through September 21, 2014. 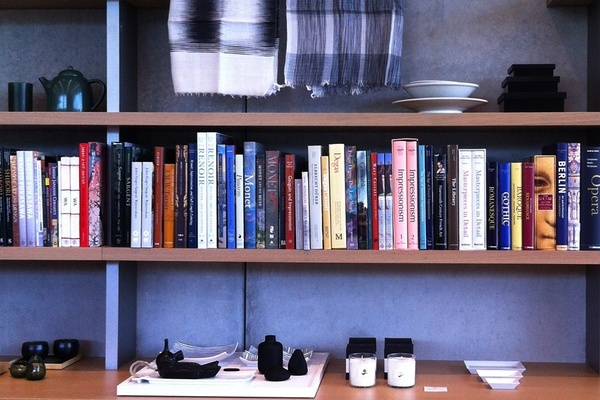 The new shop on the ground floor carries a thoughtfully curated selection of Japanese design products — ceramic bowls, teapots, tablecloths, and artsy kitchen utensils. The lower level is so well illuminated by light wells that you'd never know you were underground. 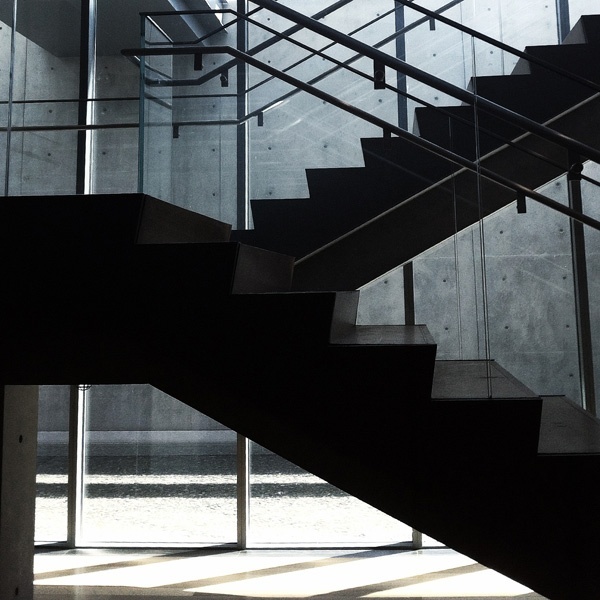 The space is divided by a large staircase, with exhibition galleries on one side and minimalist Café Seven on the other. , who recently did the cafe at the new Pérez Art Museum Miami, runs the cafe and chef in Philadelphia has created a seasonal, farm-to-table menu that includes local honey and cheeses and a custom granola. The original museum building also underwent renovations led by Annabelle Selldorf. Previous staff-only spaces have been turned into new gallery spaces, skylights have been scrubbed, walls have been painted, and new lighting has been installed. The entrance also is no longer on South Street but rather through a new Ando-designed pavillion. I leave the expansive pastoral backdrop and enter the original museum building, an intimate space filled with 19th-century American masterworks by artists like Winslow Homer, one of Sterling Clark's favorites. I see scenes of horses and pioneers and jaw-dropping seascapes. America at its finest. 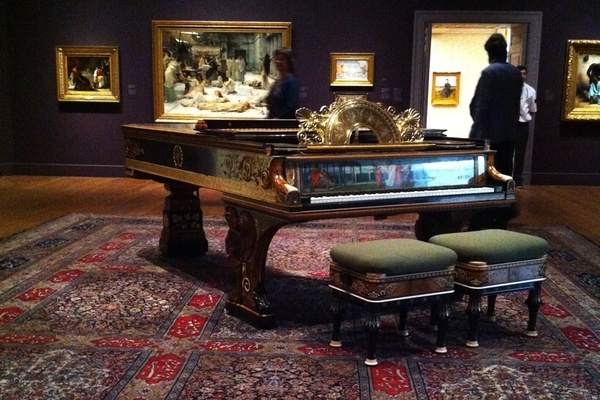 Francine Clark's Steinway grand piano designed by Sir Lawrence Alma-Tadema. Sculptures in the renovated original museum building. Raw Color: The Circles of David Smith. I wander into an entire wing dedicated to Degas, one of my favorite artists, and admire the sculpture "Little Dancer Aged Fourteen." I marvel at the ridiculously complex details in Joachim Anthonisz Wtewael's painting, "The Wedding of Peleus and Thetis," right down to the kissing couple in the top right. 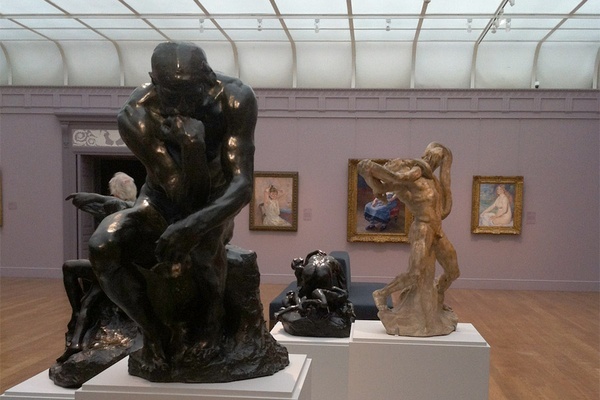 I don't have enough time to linger in the star-studded galleries and admire the wealth of Renoirs, Pissarros, Monets, and Manets, nor the Rodin sculptures or Francine Clark's elaborate grand piano. Lunder Center at Stone Hill is a ten-minute stroll away on a well-kept path past the Manton Research Center. 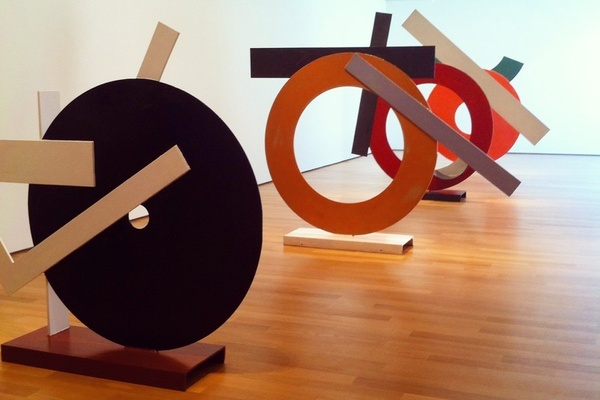 David Smith's sculpture show is on view through October 19, 2014. I spend the rest of the day basking in the warm afternoon sun on the outdoor terrace at Stone Hill Café, which is also overseen by Stephen Starr Events. Time just stops. The view from the terrace at Lunder Center. Too soon, the day comes to an end, and it is time to leave my New England painting and return to New York City. On the bus ride back, I plan my return trip. The abstract expressionist show opens on August 2, and I want to see my Pollocks and Rothkos. Museum director Michael Conforti and the curators I met threw around names like James Turrell and Jenny Holzer for potential future collaborations on the grounds, so I'll keep an eye out for those. Plus, there's that ice-skating rink this winter.